An essential auxiliary insulator that’s as warm as it is stylish, the Stratus X Vest offers condensed core warmth and classic alpine style in a toasty warm, environmentally conscious package. The Stratus’ 100% recycled polyester shell is not only durable and eco-friendly, but it features a DWR finish that sheds wind and light precip during variable winter days. Inside, Icebreaker used their innovative MerinoLOFT™ insulation, a sustainable and high-lofting alternative to synthetic fills made from all-natural merino wool (up to 10% of which is recycled), which retains warmth when wet and naturally helps regulate body temperature. Icebreaker also lined the jacket with 100% woven merino wool for incredible next-to-skin softness. Zippered front pockets keep your hands safe from the winter winds, and a zippered interior pocket keeps your valuable essentials secure. Stratus X Vest- Mens is rated 4.7 out of 5 by 7. Rated 5 out of 5 by WoolyJ from Can’t wait for some colder weather It’s too hot here to wear so far, but I tried it on and I can’t wait for some colder weather. Love the colour, the feel, the quality. Awesome as expected. Rated 4 out of 5 by Balavoine from MERINOLOFT™ STRATUS X VEST is Perfect Well designed and solidly constructed, this vest is perfect on its own or under a windproof layer. Rated 5 out of 5 by Digdog from Perfect for wearing while active Love this vest. I also have the merinoloft jacket (which is amazing as well), but I found I would get hot while wearing the jacket for a winter hike or run. 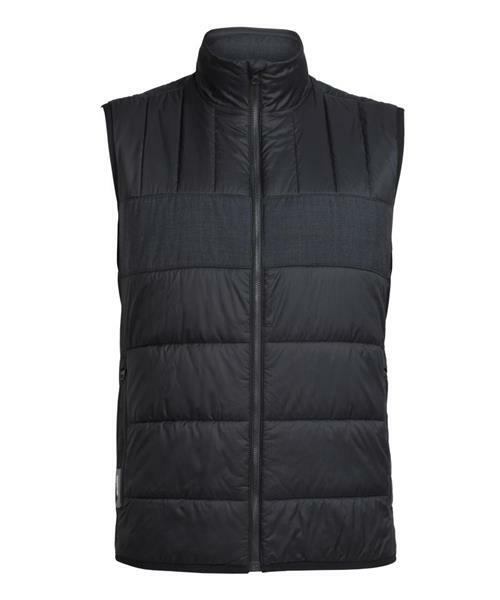 This vest is perfect for keeping my core warm without overheating. My arms are a little chilly to start (I usually wear a baselayer merino long sleeve shirt) but it’s not long till I warm up and remain that way till finished. Rated 5 out of 5 by sheet from WELL MADE A comfortable well-made and fairly lightweight vest which I use as winter-wear in and around the home. Has a pleasing matt appearance. Made in Vietnam. Rated 5 out of 5 by StephanieLivLaw from So light Lightweight, warm and comfortable. This garment is also stylish and good for layering because it is so lightweight.